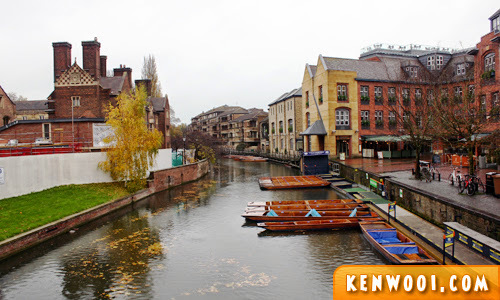 During the Great Britain Tour with Expat Explore, our first destination was 80km north of London – Cambridge. 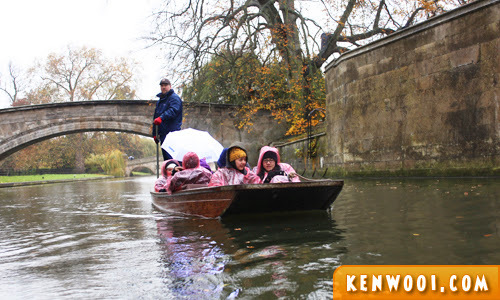 Known as a university town, our one and only traditional adventure upon arriving at Cambridge was punting along River Cam. 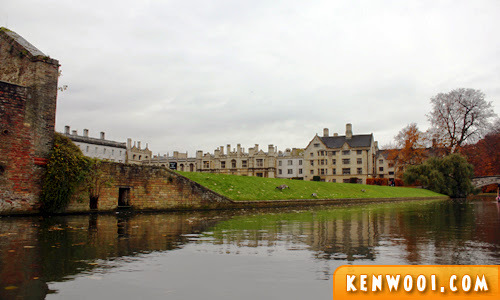 Home of the University of Cambridge, it has beautiful scenery and historical buildings to explore and punting is probably the most relaxing way to do so. On the day we were there, it was rather gloomy and drizzly – the weather that all travelers dread. Anyhow, we still went on with the popular activity. 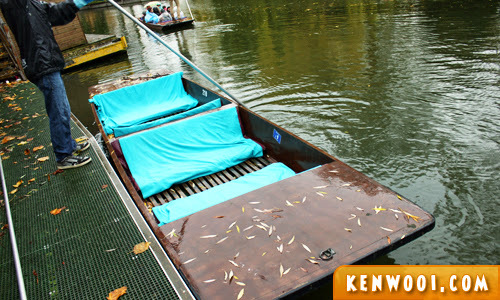 Prior to the tour, I didn’t know what “punting” was and how the mentioned “boat” look like. I only found out when we were boarding the punt. 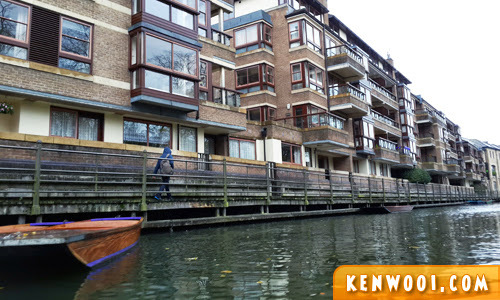 FYI, a punt is a flat-bottomed board with square compartments for the passengers and it’s designed to be used for small and shallow rivers. 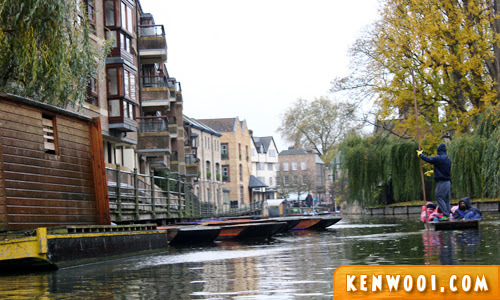 Punting basically refers to the activity of using the punt. Anyway, we left the dock as the punter (the dude who rows the punt) brought us along the river. The entire punting session was about 45 minutes and the punter shared and explained historical moments and tales in Cambridge. 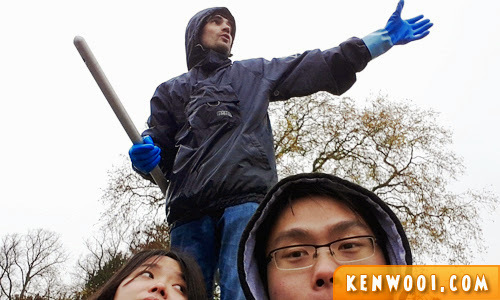 Despite the cold weather, it was quite a wonderful experience. We passed by several buildings built along the river bank. Majority of use were in ponchos because it was drizzling. Besides that, we passed by the university area as well. Imagine studying in such an elite educational environment – sure very stressed! The punter sure did mention the name of the individual colleges or academic departments (that form the University of Cambridge) as we passed by them but I can’t remember any. Heh. 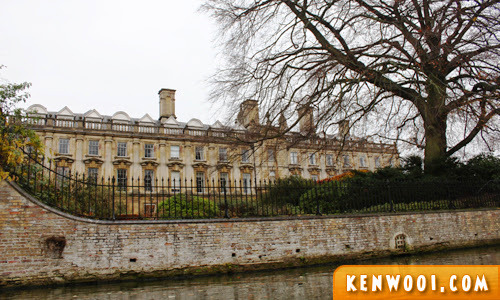 Also, Cambridge is the place where the heirs of the British Monarchy receive their education at some level. He looked like a statue on this photo though. Heh. It’s SO white I’m gonna turn into an ang moh! I’ve two ex-students studying there, one basic degree and another his PhD and an old friend doing his post-doctorate. I dropped by Oxford, didn’t make it to Cambridge – hope to visit one day.